Minister of Finance and the Public Service, Dr. the Hon. Nigel Clarke (right), emphasises a point during the discussion segment of the Destination Experience Masters of Industry Reception, which was held at the Mercedes Benz showroom on South Camp Road in Kingston on April 5. Listening is Dean Emeritus at the New York University's Stern School of Business, Peter Blair Henry. Minister of Finance and the Public Service, Dr. the Hon. Nigel Clarke, says there is need for greater levels of local investments, in order to sustain Jamaica’s economic growth. “We have had a lot of foreign investment. But I don’t think domestic investment has yet been unleashed in the way that it can and ultimately will,” he said. The Minister was speaking at the Destination Experience Masters of Industry Reception, which was held at the Mercedes Benz showroom on South Camp Road in Kingston on April 5. Minister of Finance and the Public Service, Dr. the Hon. Nigel Clarke, says there is a need for greater levels of local investments, in order to sustain Jamaica’s economic growth. “We have had a lot of foreign investment, but I don’t think domestic investment has yet been unleashed in the way that it can and ultimately will,” he said. Minister of Finance and the Public Service, Hon. Dr. Nigel Clarke (right), responds to questions posed by Dean Emeritus at the New York University’s Stern School of Business, Peter Blair Henry, during the discussion segment of the Destination Experience Masters of Industry Reception, which was held at the Mercedes Benz showroom on South Camp Road in Kingston on April 5. Dr. Clarke noted that the Government has been working to restore economic stability through the implementation of policies that “encourage and incentivise greater levels of domestic and foreign investment”. 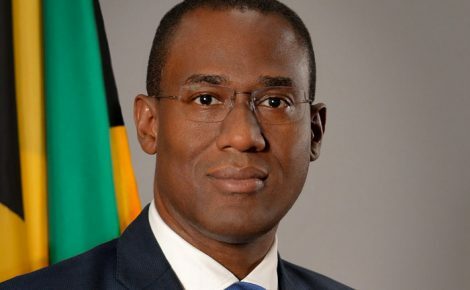 “We believe that the environment today and the policy choices we have made will encourage domestic investment to be unleashed in Jamaica in ways that it hasn’t in a long period of time,” he said. The Finance Minister argued that while ongoing economic reform has resulted in 16 consecutive quarters of growth, there is a need for greater value-added in the country’s production and output. “If you look at the composition of Jamaica’s gross domestic product (GDP), about 30 per cent of it is in the goods-producing sectors – construction and mining, agriculture, and manufacturing, and about 70 per cent is in services. We are seeing strong growth within the goods-producing sectors… but because those are small segments of the economy, they don’t translate into overall large growth. While, on the services side, we are seeing lower growth,” he explained. Dr. Clarke pointed out that greater value-added can take place in the economy through “backward integration” in terms of tourism, and allowing more manufacturing businesses to be established in Jamaica. Minister of Finance and the Public Service, Hon. Dr. Nigel Clarke (right), in discussion with Dean Emeritus at the New York University’s Stern School of Business, Peter Blair Henry, prior to the start of the Destination Experience Masters of Industry Reception, which was held at the Mercedes Benz showroom on South Camp Road in Kingston on April 5. “We are seeing firms from the region establish manufacturing companies in Jamaica to access the northern markets; that’s something that never happened before,” he noted. The Minister further argued that in order to continue realising growth, the economy has to be made more efficient by, among other things, dealing with the associated cost factors. “In the last budget, we dealt with some of those fiscal costs, those transaction costs that lead to inefficiency and lead to inefficient allocation. We have a lot more work to do, not just in the fiscal side, but on the regulatory side and on the microeconomic structures that lead to inefficiency,” he said. Dr. Clarke noted that making the economy more efficient also involves training persons who are entering the workforce, to ensure they are productive. The reception formed part of the Destination Experience Visionaries’ Summit, held from April 4 to 6. The summit offers a multi-stakeholder business acceleration environment, to enable decision-makers from around the world to connect with their peers in untapped markets in order to drive economic transformation and growth.